Large with a carapace that is slightly heart-shaped and rusty brown in color which is extremely hard and bony. Each front flipper contains two claws. Adults weigh 200 to 700 pounds / 3 to 4 feet in length. Age at maturity range from 20 and 40 years. Nest in Florida from late April to September. Powerful jaws crush clams, crabs, whelks, conch, and jellyfish. 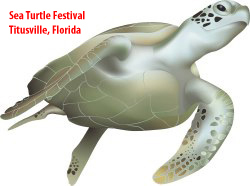 Named for its large head which may be 10-12 inches wide. 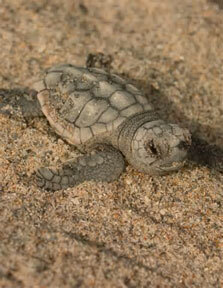 90% of the loggerhead nests found in the United States are in Florida. 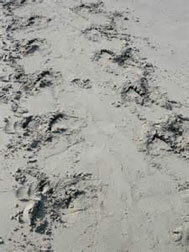 Florida's east coast from New Smyrna Beach south to Boca Raton accounts for more than 80% of the nesting crawls or tracks observed on the east coast of the United States. 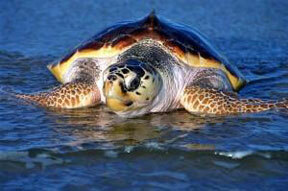 Loggerheads are the most abundant species of turtle in U.S. coastal waters. Approximately 30% of the nesting females have shark bites on them. 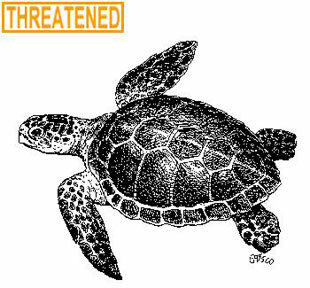 The crawl-pattern of nesting loggerheads consists of alternating comma-shaped flipper marks with no tail drag through the center.